It was a bit of a disparate night: Blue was late thanks to a disastrous day at work and Black and Purple were able to come for the first time in ages, but arrived even later and hadn’t had any supper. So after Red, Burgundy and Magenta had finished discussing JunKing, Red, Burgundy, Magenta, Pine and Green played a quick game of The Game. This simple cooperative game has very simple rules: Play a minimum of two cards on any of the four piles following the appropriate trend – two piles must always increase, two decrease; the exception to this is if you can play a card where the interval is exactly ten in the wrong direction (known as “The Backwards Rule”). Players can talk about anything so long as there is no specific number information given and the aim is to cooperatively get rid of all ninety-eight cards by playing them on to the four piles. With a hand of just six cards and some players staring with nothing but high cards and others with only cards between forty and sixty, it was always going to be challenging. In our experience, playing with five is also more difficult, so as a result, at the start of the game expectations weren’t high. As usual, there were howls of horror as players were forced to play cards that others didn’t want. Magenta started out with a really nice combo of four cards, but after that everyone just stepped on everyone else’s toes. Eventually though, much to everyone’s surprise, the deck was gradually whittled down and before long the final cards were drawn from the deck and players were looking to maximise the number of cards they were going to play from their hand. With only one playable pile at the end it was always going to be difficult and unfortunately, Burgundy was forced to bring the game to a close leaving a combined holding of five cards. With Blue finished and Black and Purple just arriving, we decided that the week’s “Feature Game” Between Two Cities would be nice and quick. Sometimes (like last week) “nice and quick” turns out to be “a bit slow”, but this one has simple rules and rattles along at a good pace. The game is set in the early 1800s, a time of immense construction and urbanization with players designing new cities. It is an unusual game as players work in pairs building two cities, one with the each person they are sat next to. The cities are made up of square tiles and the final layout is a four by four grid. Since players gradually add tiles to their city, the amount of available space decreases and players have to be more discerning about where they build. The game is played over three rounds. The first and third are tile drafting rounds, similar to games like 7 Wonders and Sushi Go!, except that players are drafting small square tiles instead of cards. So, in these first and last rounds, each player begins with seven tiles, everyone simultaneously chooses two, and passes the rest on. 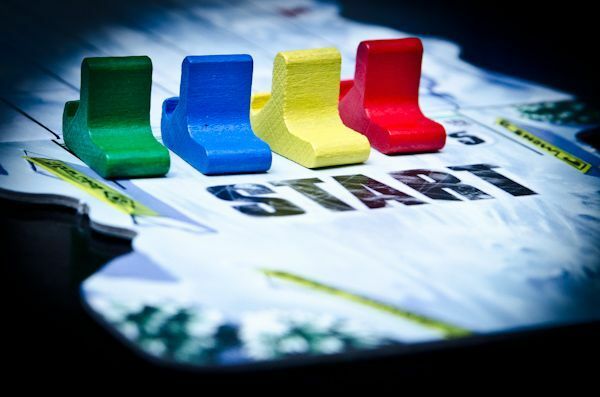 Once everyone has chosen, players can discuss what to play and where, before placing one tile in each of their cities and then picking up their next hand. In the first rounds cards are passed to the left, in the third round to the right. Between these two rounds, players are dealt three double sized tiles each from which they choose two to play. Since these must be placed the right way up and can be in either horizontal or vertical configurations, the choice and placement of these is quite critical, and are probably key producing the best city. Each city is scored separately at the end of the game and the winner is the player with who gets the most points for their lowest scoring city. Points are awarded to each city for each building in it, but the score depends on the type of building and where it is placed. For example, yellow shops score when placed in a row. A single, isolated shop will score just one point, but two adjacent shops score five and three in a row score a total of ten. Similarly, the first green park tile will score just two points, but if three are placed in a group, they will score twelve points. The scoring for some buildings depends on what else is present in the city however. Houses flourish best when there are a variety of other types of building nearby, so their score depends on the number of different buildings across the whole city. On the other hand, nobody likes living next to a factory, so a brown house tile next to a grey factory tile will score just one point regardless of everything else. Only Burgundy and Green had played the game before, but as Burgundy explained when people asked for advice, although he’d played well and even won in the past, he never had any idea how. So everyone was on their own pretty much, and when the first hand of tiles were dealt out, it felt like a bit of a lottery. As the game progressed, everyone discussed what they were trying to do with their neighbours and, before long players were struggling to find the best tiles to play to maximise their final scores. Magenta was trying to decide which of her two cities (shared with Blue and Red) should have the final entertainment establishment and a complete set, and Pine and Burgundy were busily industrialising their city to pick up a few extra points. In the final scoring, it was Blue and Magenta who’s city came out best with sixty-three, though the winning city is usually irrelevant. In Between Two Cities, players total up the points for both cities, but it is their lowest score that is compared and the higher is only a tie-breaker. Thus, players are trying to maximise both cities equally. In this case however, the second best city was built by Blue and Burgundy, so Blue took first, with Magenta in second place. This game was a win all round though as everyone had enjoyed it. The game was originally funded though KickStarter, and these games often feel a bit incomplete and lacking in finishing touches. This one, however, had a really good feel about it, the right amount of length for its depth and beautifully executed – definitely a game that will come out again. With Black and Purple finished and ready to play, there was some debate about what to go for. Green had been desperate to play Rockwell for about three years, so when he heard Blue had brought it, he was keen to give it a go. Meanwhile, Purple had been feeling aggrieved at the fact that Snow Tails had been shouted down at the previous Didcot Games Club meeting, so when Black said he would play it with her that pretty much set the games and everyone divided into two groups, with Magenta and Red joining Black and Purple to race dog sleds. 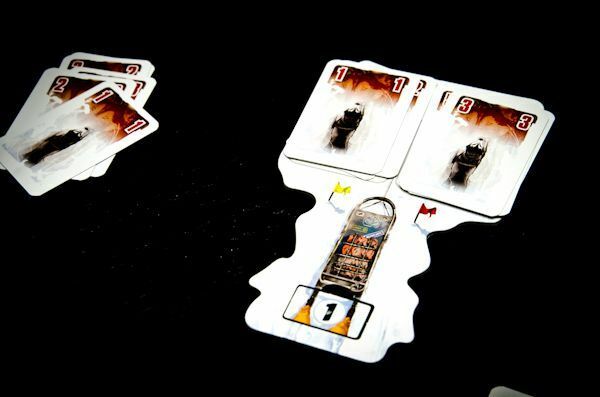 Snow Tails is a fun dog-sled-racing game where players built round a deck building and control mechanic. Each player starts with a sled drawn by two huskies. At the start of the game, each dog has a speed of three, and the break is also applied at a level of three. Thus, the sled-speed is the sum of the dogs minus the value of the break, i.e. everyone begins with a speed of three so and move three spaces forward. In addition, since the dogs are pulling evenly, this movement is in a straight line, but the also sled achieves a bonus equal to their position in the race. On the other hand, if the left dog had a speed of four and the right hand dog had a speed of two, although the sum would be the same, the difference of two means that the sled must also drift two lanes to the left. This “drift” can be applied at any point during the sleds move, so two of the moves are diagonal rather than just straight ahead. 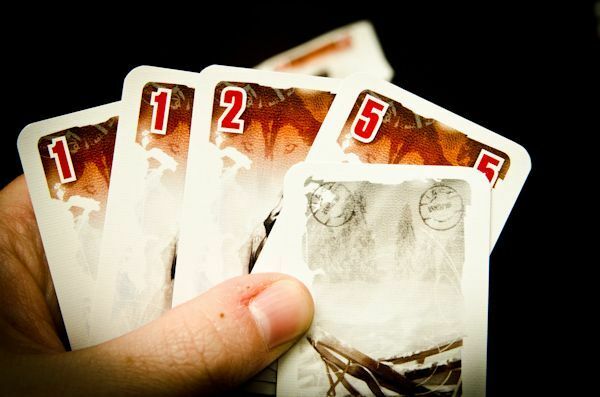 Each player begins the game with the same deck of cards – five sets of cards numbered one to five, shuffled, from which they draw a hand of five cards. On their turn, the active player must play at least one card, but may play up to three cards, so long as they all have the same value. These cards are used to update either or both dogs, and/or the break. 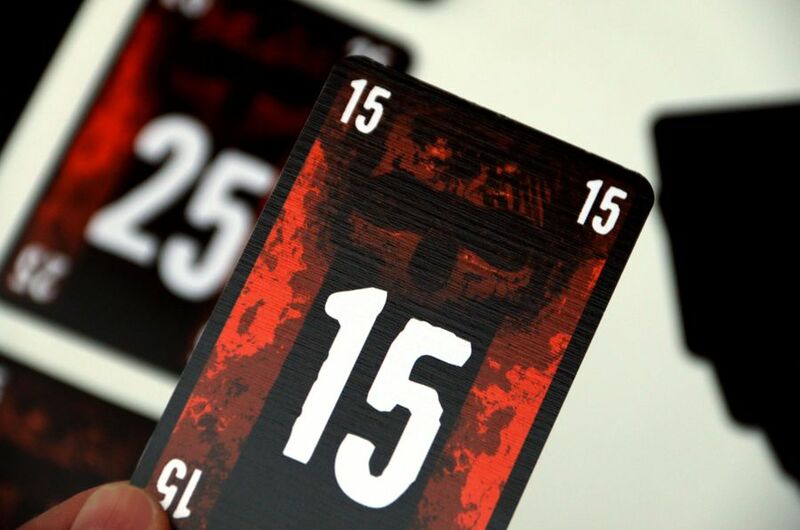 When they have completed their move, players draw cards from their personal deck back up to the hand-limit of five. Thus, players use their cards to navigate their sleds round the avoiding obstacles and attempting to observe the speed restrictions. Failure to do either incurs penalty “dent” cards which go into the player’s hand reducing the number of playable cards. This reduces their ability to control their sled and increasing the chance of them hitting obstacles and getting more dent cards, thus chaos reigns. The track is custom built, and we started off trees and finished with a sharp bend. Black got the best start and, got lucky through the pines giving him a healthy lead which he held throughout. The race for second place was very tight however, with Purple, Red and Magenta taking it in turns at the front of the pack. Eventually, Red lost ground round a sharp corner and Purple finally got her nose ahead of Magenta to take second place. Meanwhile, it was quickly becoming clear that Rockwell was a much more complex undertaking. Not only were there an enormous number of pieces to sort out, it was also a few weeks since Green had read the rules. The rules were quite complex and Blue’s, Burgundy’s and Pine’s very puzzled expressions had changed to confused bemusement long before Green had finished explaining. The gist of the game is that players are the managers of a mining company, each with four drilling teams. Each round is made up of four phases: first players deploy their two managers, then they deploy their drilling teams, next they can sell or buy resources in the market and finally players can buy upgrades, for example, making their drilling teams more effective. 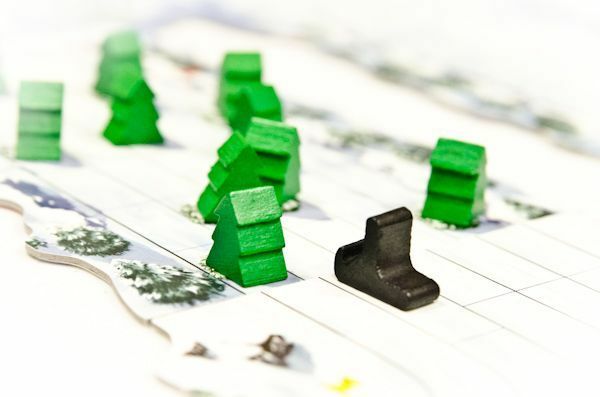 Thus, at its heart, the game is a worker placement and it is all about how players deploy their managers and then how they use their resources once they have got them. These are just the sort of game Green likes best and also the sort of game Burgundy excels at. 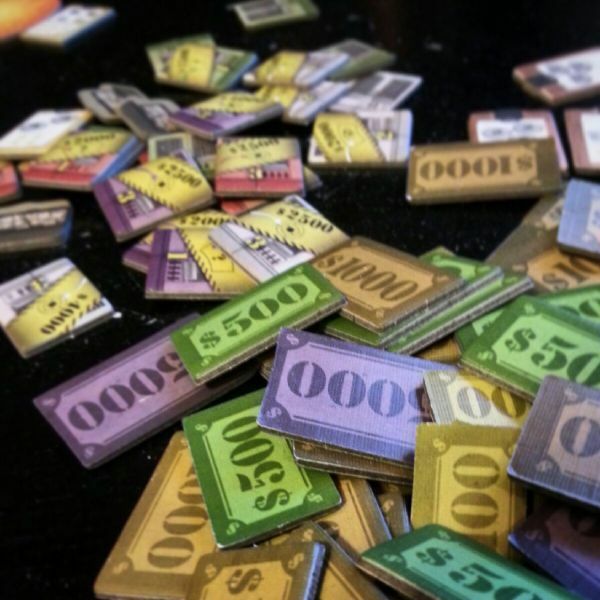 In the fiddling with the small rules, however, we’d sort of lost sight of how players actually win: basically there are achievement tiles and when people manage to fulfill the requirements of an achievement tile, they take the top one off the pile. Since these are sorted so that their value decreases, there is an advantage to getting there first. The achievements are a little strange and it took Pine a moment to grasp that, for example, players only needed to have eight zinc and eight copper to qualify for a tile; they did not need to actually spend the resources. Players can also trade resources for points in the upgrade phase, though in this case, the resources are returned to the main supply. There are definitely a few very clever mechanics in the game and it is also beautifully produced with a lot of thought going into the design and rendition. 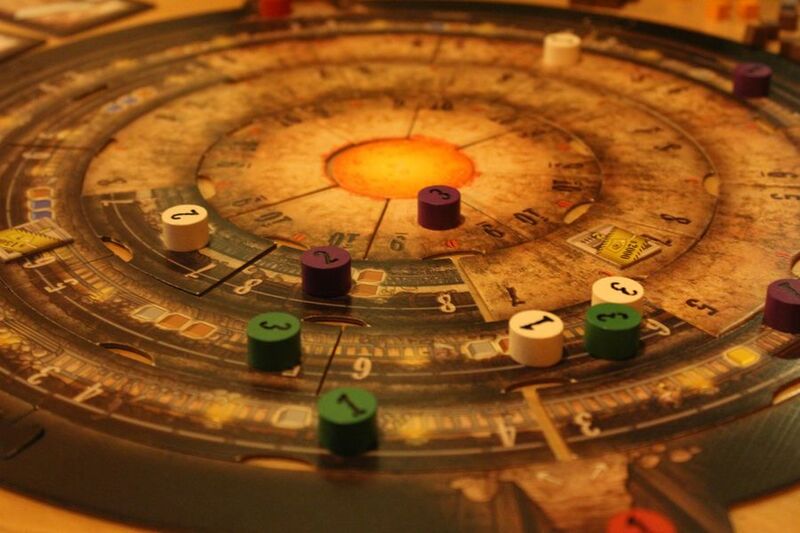 The game board is circular, but is made of slightly curved tiles forming concentric layers so that the layout is different every time and players don’t know which resources will be produced where. Players move their mining teams around and between the strata and a layer is mined when an appropriate number of miners are there. 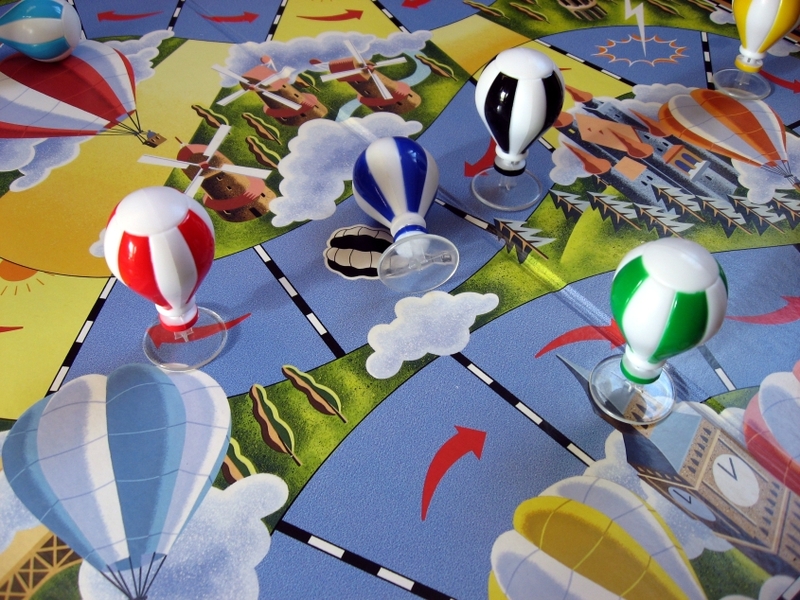 Since each player starts with four teams of one spread out evenly around the surface and the first layers need a total of three or four, this means there is necessarily cooperation and player interaction in the game. Once the total for a given mine has been exceeded, the tile is turned over, and a corresponding card drawn indicating the resources to be allocated. Unusually, these resources are divided up equally regardless of the number of miners each player has contributed, however, the left-overs (dubbed “The Lion’s Share”) are given to the player with “priority”, a point we mostly never truly got to grips with. It was always going to be one of those games. The other table were well under way before Green had even finished reading the rules and once he had, everyone was still a bit clueless as to what to do, so it was largely through chance that Blue managed to pick up the first achievement tile. At which point, perhaps in shock, Green dropped a pale blue zinc cube on the floor and the next half hour was punctuated by people hunting for it. Black took a couple of breaks from the husky racing and made curiosity type noises as he passed and tried to work out how the game was going. After the first couple of rounds, players finally began to understand what they were trying to do, though the rules of who got “The Lion’s Share” remained pretty baffling right up to the end. Before long, Burgundy was also picking up achievement tiles followed by Pine, but by this time Snow Tails was coming to an end. This led to a discussion about how much longer Rockwell was going to take, at which point, Blue realised her watch had stopped and it was nearly midnight… Yes, it was definitely one of those games! Green decided we were unlikely to make it to the end, the game would take some time packing up and his curfew was approaching. So in the end we just scored what points we had and left it at that. Everyone felt they were on the way to pulling in points, but it was Burgundy who had the most with fourteen, four clear of Blue with ten. Despite his confusion, Pine had picked up five points and only Green had failed to score, largely because he was focusing on the rules. It was a very unsatisfactory end and we definitely have unfinished business with Rockwell. Packing up didn’t take as long as predicted, and Pine did eventually find the missing zinc cube only for Blue to throw a white cube on the floor instead and the Great Cube Hunt to begin again. With Red and Magenta waiting for their lift, there was some discussion about starting a quick game of Bellz!, but despite its festive feel, there wasn’t really time even for that. So it was Christmas Greetings all round and time for home. Learning Outcome: Don’t start long complicated games after 9.30 pm, especially if they are new! This entry was posted in Games Night and tagged 7 Wonders, Bellz!, Between Two Cities, Hunt the Game Piece, JunKing, Rockwell, Snow Tails, Sushi Go!, The Game on December 28, 2015 by nannyGOAT. This week we had two new people, who arrived early, so we started the evening off with a quick four-player game of No Thanks! This is a very, very simple push-your-luck game with just a hint of strategy and probably one of the best games going for its size. The idea is that you turn over the first card in the stack and either take it or pay a chip. If you take it, you turn over the next card, if you pay, the decision passes to the next player; the person with the lowest number of points when the cards run out wins. The strategy comes because for runs of two or more cards, only the lowest counts, but unfortunately, someone removed nine cards from the deck at random… Just as we were finishing the first round, another player arrived, so as it is such a quick game we gave it another go. Since it was gone 8pm, we decided to play the “Feature Game” which was The Great Balloon Race. This is a light hearted, relatively quick race game with quite a lot of luck, and (as it turns out) a lot of vendettas against certain colours with orange and blue being the most victimised. One of the really nice things about this game was the way that people at the back who felt they had no chance, were able to catch up and indeed win. With five games something of a record, we managed to squeeze in a game of Snow Tails. This is a very pretty game of dog-sled racing, but the choice of game was possibly a mistake given the time, compounded by the fact that we used a more complex track than was wise, and we were playing with the full five players (three of whom were new to it). Basic numeracy proved to be something of a challenge and the “Big Paws” token changed hands several times as the dents in the sleds increased and the saplings took a beating. However, most people were in the lead at some point and in the final run for the line, everyone was within one turn or so of finishing the race. Learning Outcome: Basic skills such as being able to add up and tell your left from your right can be really useful when mining, flying balloons, and especially driving dog-sleds! This entry was posted in Games Night and tagged Boomtown, No Thanks!, Snow Tails, The Great Balloon Race on October 31, 2012 by nannyGOAT.